Moon said at a forum in Singapore on Friday that Trump and Kim would "face the stern judgment of the international community" if their promises on denuclearisation weren't kept. 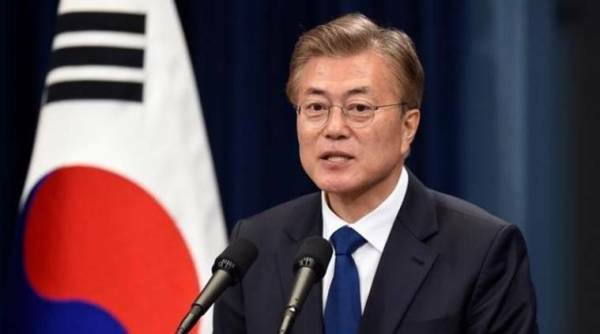 Singapore: South Korean President Moon Jae-in has urged US President Donald Trump and North Korean leader Kim Jong Un to try harder to achieve a breakthrough in their nuclear negotiations. Moon said at a forum in Singapore on Friday that Trump and Kim would “face the stern judgment of the international community” if their promises on denuclearisation weren’t kept. Singapore was the host of a historic summit between Trump and Kim last month when they agreed to work toward the denuclearisation of the Korean Peninsula, without describing when and how it would occur. Follow-up talks between US Secretary of State Mike Pompeo and North Korean senior officials have got off to a rocky start with Pyongyang accusing Washington of making “unilateral and gangster-like” demands.